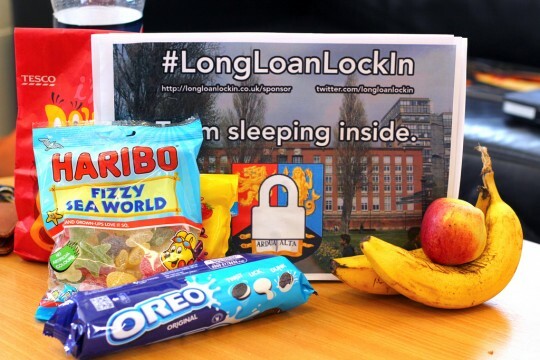 Three UoB students staked out in the library for an entire week in aid of raising money and awareness for Birmingham Nightline. With the library now being open at all hours and the thought of failing exams looming over you, the idea of being there 24/7 may seem a rather tempting prospect. UoB students David Franklin, Sam Jones and James Phillips decided to do just that. Not only are they trawling through as many books as they can, they’re also raising money for charity. Franklin, Jones and Phillips have chosen to lock themselves in the library during deadline week – one of the most stressful weeks of the year. The boys stress that taking care of your mental health shouldn’t just be about one week, however, as uni can be challenging for lots of different reasons and everyone needs support at times. This is why they’re raising money for Birmingham Nightline, the service run by students, for students. Nightline offers confidential, non-judgmental advice and the line is open 6pm – 8am every night of term. The boys describe the #LongLoanLockIn as “a battle of physical endurance, mental strength and supreme procrastination, but above all, it will be a battle to maintain personal hygiene.” They’ve currently been in the library for five days-I hope that friends have been visiting with deodorant! “We came into this wanting to raise money, wanting to raise awareness, we didn’t think we’d actually be directly helping people. To track their progress – watch the video blog here. So far, Franklin, Jones and Phillips have raised a whopping £854.18 for Nightline! Click here to sponsor them. Some kind students have even opted to sponsor the boys per hour that they stay in the library – now that’s an incentive!